Supermodel Coco Rocha sporting a simple side braided hairstyle that can be used..
Supermodel Coco Rocha sporting a simple side braided hairstyle that can be used for casual or even beach weddings. The roughed-up top creates a relaxed feel to the whole look. Just add in a few touches such as fresh flowers or intertwining silk lace to the plait to glamourize the look. Before Coco Rocha chopped off her gorgeous mane into a punk pixie, she played ar..
Before Coco Rocha chopped off her gorgeous mane into a punk pixie, she played around with various hairstyles that have proven to be swoon-worthy. We love her in this classic ballerina bun. It’s sleek all around, but the bun itself is slightly loose. This is a highly versatile hairstyle that is appropriate for formal occasions and even on normal bad hair days. 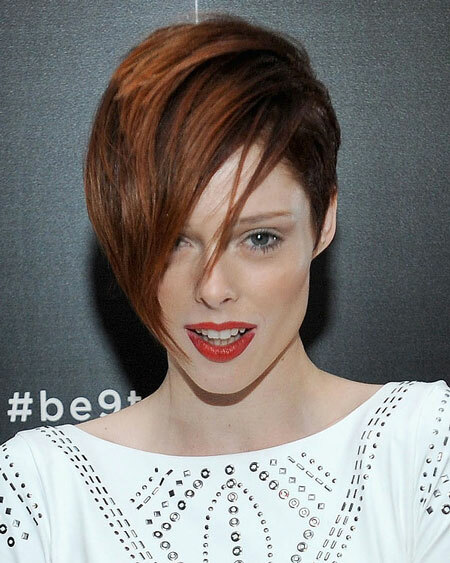 Coco Rocha deserves a good praise for switching to this punk glam hairstyle! The..
Coco Rocha deserves a good praise for switching to this punk glam hairstyle! The multi-dimensional coif with closed crop sides and a wispy quiff will suit all face shapes. It apparently took the model six months to get permission from her fashion bosses for this cut! Worth the wait! Hot commodity supermodel, CoCo Rocha, arrived at the 2013 Costume Institute Ga.. Hot commodity supermodel, CoCo Rocha, arrived at the 2013 Costume Institute Gala – PUNK: Chaos to Couture at Metropolitan Museum of Art in a super sleek low ponytail with blunt fringe. Not exactly a punk ‘do, but stylist Veronica Chu said that they opted for a clean hairstyle as a contrast against her embellished Emmanuel Ungaro gown with high neckline.